The tee shot here is the key. A tough hole in any conditions, but especially if the wind is into your face from the back tee. 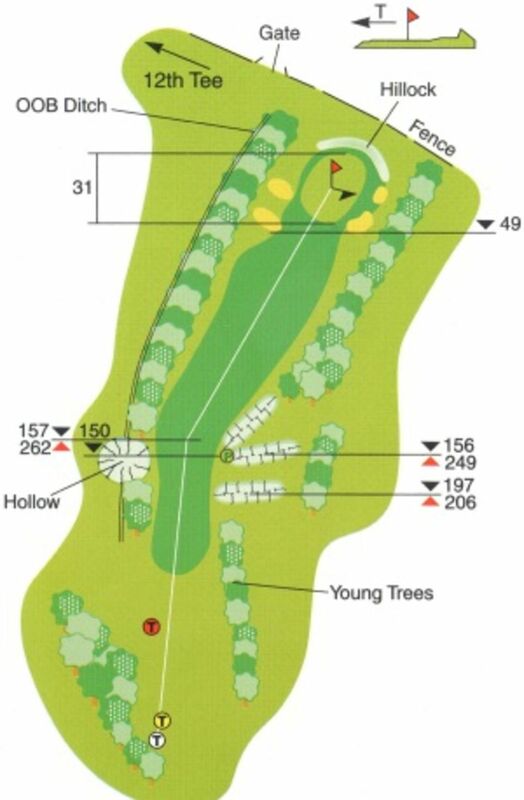 A line of large trees line the fairway on the left, whilst smaller trees run down the right, with the same grass mounds from the tenth providing additional obstacles if the tee shot is not as accurate as required. Depending upon the distance and position of the tee shot the decision is whether to play for position or go for the green. Out of bounds down the right, two fairways bunkers down the left will influence how you make your mind up. The green is narrow but long, with a bunker on the front right and a bank at the rear to stop the running shot from going out. A pin position front right will leave you with a tricky approach shot.